Hooray for North American Wildlife! New Zealand may have some of the more unique and awesome animals on the planet, but for sheer variety, North America is the winner. For my kids, squirrels, chipmunks, and turtles are amazing sights. Bright cardinals, drumming woodpeckers, and colourful butterflies are exotic treasures. To come across a deer in the woods is the event of a lifetime. Even the forest floor is teeming with exotic creatures. Here is one of my favourites—Apheloria virginiensis. Sometimes called the almond bug, this large bright millipede uses cyanide compounds to protect itself from predators, giving it an almond smell. 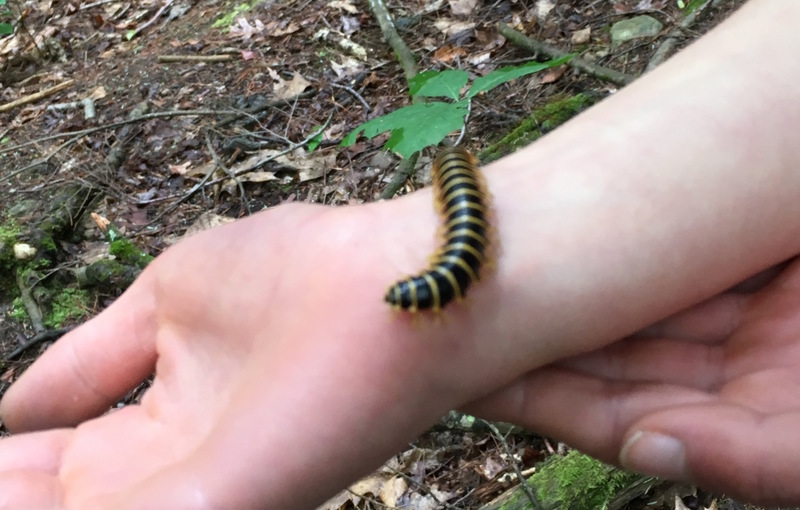 Most millipedes use chemical defenses, so it’s nothing out of the ordinary in the millipede world, but who could resist the charm of this lovely creature? Of course, spraying cyanide at your enemies isn’t particularly charming. Though they are harmless to handle, do wash your hands afterwards, because the poison can be quite irritating if you get it in your eyes.